U.S. economy and consumer remain healthy. Both consumer spending and incomes rose in April with the former outpacing the latter as inflation, though hovering just below the Federal Reserve’s (Fed) 2% target, remains moderate. More specifically, outlays for household utilities and energy-related goods drove consumer spending up 0.6% (consensus estimates were for a 0.4% gain), its largest gain in five months; incomes ticked up 0.3% versus +0.2% in March. Meanwhile, the Fed’s preferred inflation measure, the core Personal Consumption Expenditure Index, held steady at 1.8%; though it’s likely to breach the Fed’s target in the coming months. Overall, the data suggest the U.S. economy and consumer remain in good shape and likely keeps the Fed on track for its second rate hike of the year when it meets next month. Jobless claims better than expected. Initial filings for unemployment benefits were less than expected (221k vs. 228k), as were continuing claims (1726k vs. 1750k). With claims continuing to hover near 40-year lows and the overall unemployment rate below 4%, labor market data continue to be a tailwind for the Fed in its interest-rate hiking campaign. Italian bond markets have calmed significantly. Italy’s 2-year yield fell as much as 90 basis points overnight while the 10-year dropped as much as 20 basis points. Markets have been calmed by Italy’s latest efforts to form a government and avoid new elections this summer that could be perceived as a referendum on the country’s membership in the European Union (EU). Though political uncertainty in Italy is nothing new, this latest bout of volatility highlights some of the structural challenges Europe faces that may constrain growth and upend financial markets periodically (and by the way, Spanish Prime Minister Rajoy may be on his way out). We continue to tactically favor U.S. and emerging market (EM) equities for suitable clients. Steel and aluminum tariffs for the EU? EU leaders are reportedly staging a last-ditch effort to get extended relief beyond the June 1 deadline. While most attention is on China as Commerce Secretary Wilbur Ross continues talks this week in Beijing, the trade spat with Europe, while generally considered a small threat in dollar terms, bears watching. Stronger than expected Chinese manufacturing data. China’s official purchasing manager’s index (PMI) came in at 51.9, up from the prior month (51.4) and above consensus forecasts (also 51.4); services were particularly strong at 54.9. 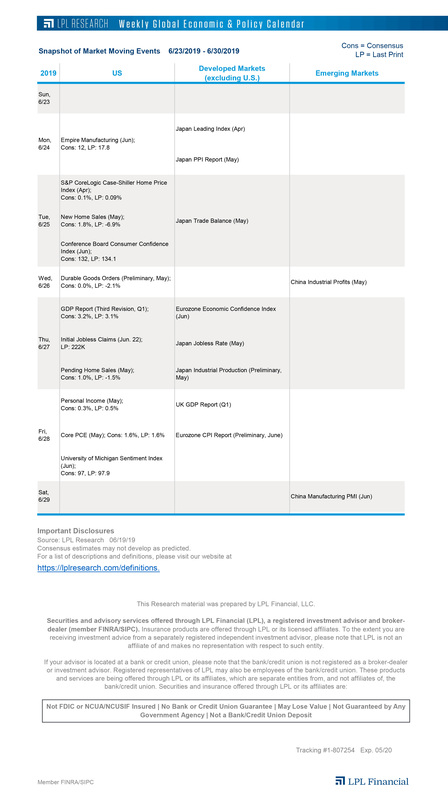 Trade risk remains but China’s economy remains on a solid trajectory that we think will support better overall economic growth in EM and strong performance for the markets broadly over the course of the year. European inflation picks up on higher oil prices. Headline inflation in the Eurozone picked up to 1.9% year over year in May, above expectations (1.6%) and April’s 1.2% reading. The more relevant core reading rose just 1.1%; though above expectations of 1.0%, the benign reading coupled with the latest flare up in Italian debt markets and evidence of slower economic growth in the region of late suggest the European Central Bank will likely employ a go-slow approach, which may limit the euro’s gains, as it looks to pare back stimulus later this year.